Why Is Asbestos Testing Necessary? Popcorn ceilings like this are often asbestos containing and should be handled with caution. Our All Pro Restoration technicians are asked on a daily basis why they need to test for asbestos. 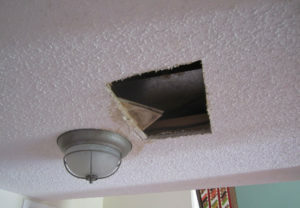 Most homeowners do not understand asbestos and do not realize how common the use of asbestos was and actually still is. While the importation of asbestos was halted in the late 70’s, asbestos was still being sold on the shelves all across the United States for many years thereafter. Retailers were not about to lose profits and take those products off the shelf; they had to sell through them. With that said, there is no way of knowing when the use of asbestos materials actually stopped in the United States. Or, if a contractor temporarily retired from the construction industry but kept his supply of materials from the 70’s and started using those materials again, years later. Because of the uncertainty of whether or not a home might be asbestos containing, the restoration industry took to the practice of having every home tested before removing suspect asbestos containing materials. In 2009, an insurance carrier issued a letter to all their preferred contractors that asbestos testing was not necessary and therefore they would no longer be paying for the testing fees. In response to this, the Colorado Department of Public Health & Environment issued a letter outlining that in the state of Colorado asbestos testing was mandatory, no matter the age of the home. The only exception is if the contractor can produce a letter certifying that no Asbestos Containing Materials (ACM) were used during the construction of that home; but this is still only for homes newer than October 12, 1988. To see a copy of the letter, click this link, Colorado State Letter for Asbestos Testing. 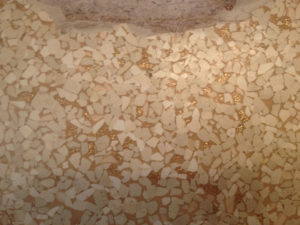 Gold flecked materials like this vinyl flooring are often an indicator of asbestos containing material (ACM). Therefore, All Pro Restoration, according to state law, will test any and every home, prior to removing any drywall or vinyl materials. Some suspect insulation types and cove base mastics will also have to be tested prior to beginning removal. 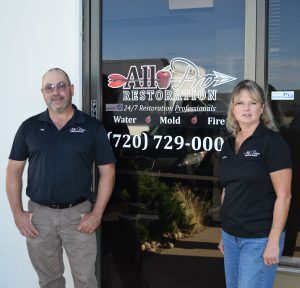 All Pro Restoration uses in-house Certified Building Inspectors for all of our asbestos sampling. These Building Inspectors are specially trained at taking asbestos samples in a safe manner that will not put any homeowners at risk. To provide an even better service, All Pro Restoration does not actually process the samples that are taken from a job site. These samples are dropped off at an independent lab, called Reservoirs Environmental, where the samples are processed and results are returned to All Pro Restoration via verbal and written results. This entire process provides every homeowner with an unbiased analysis of the materials in their home. Each homeowner knows that they are being treated fairly; there is never a concern for inflation of the scope of work when this independent asbestos lab testing process is used. Lead is a toxic metal which was used in buildings commonly before the last couple decades. It may be found in paint or sometimes other building materials, and can seep into water through lead pipes, which is dangerous for your health. Exposure to lead can lead to adverse health effects including seizures, disabilities, learning or behavioral problems, and more. Children are most at risk for these effects. It is important that if you suspect lead in your home, air, or water that you contact All Pro Restoration immediately for testing and inspection. Adults can also be effected, leading to high blood pressure, reproductive issues, nerve disorders, and more. Lead paint is currently banned by the federal government since 1978 and some states even earlier. However, homes built before this time are at risk of having lead as part of their structure. Call All Pro Restoration now for lead testing and inspection!